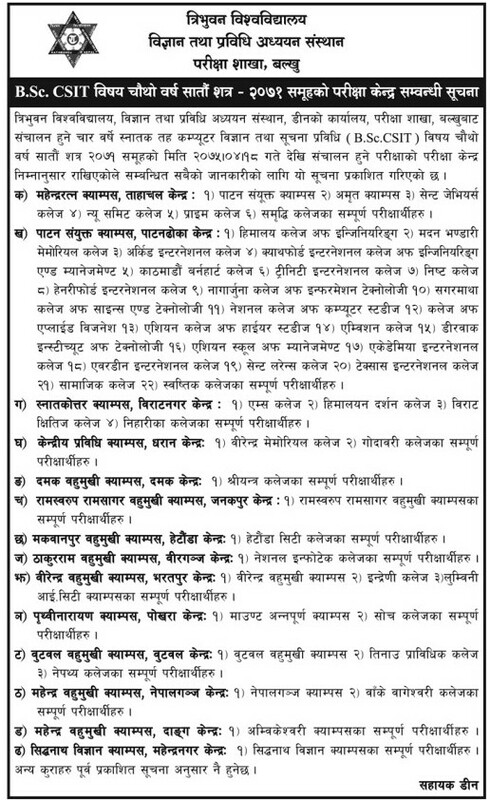 Tribhuvan University, Institute of Science and Technology, Dean Office, Exam Department, Balkhu, has published the exam centers for 4 years B.Sc. CSIT (Bachelors of Science in Computer Science and Information Technology) of Seventh Semester Fourth Year. The examination starts from Shrawan 18, 2075 onwards and ends on Bhadra 03, 2075 (August 3, 2018 - August 19, 2018). The Examination time is from 12 pm to 3 pm.